for $375,900 with 3 bedrooms and 3 full baths, 1 half bath. This 3,670 square foot home was built in 2008 on a lot size of 3.800 Acre(s). 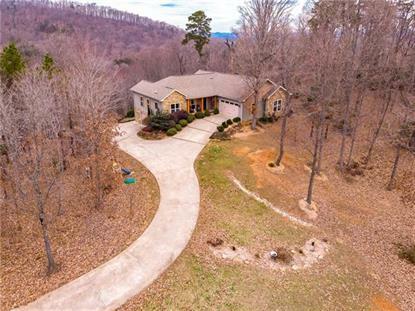 Stunning home sitting on top of a gorgeous mountainside with 3.8 Acres! You'll feel closer to heaven at this gorgeous property with the lovely views! This custom home offers a low maintenance exterior with stone, vinyl shake, and high end vinyl siding. The yard was professionally landscaped with stone, shrubs, and lots of perennials. The interior is meticulously maintained and offers high-end superior-quality mill work including trim, baseboards & crown molding! Other unique features include hardwoods, whole-house audio, and a stacked stone gas log FP! The gourmet kitchen offers custom Merillat cabinetry(w/lights), granite counters, SS appliances, gas range, extra prep sink, breakfast bar, and a pantry in adjoining laundry! Adjoining dining area overlooks the mountains! The split BR plan offers a private master suite w/sitting area, exit to rear screen room and adjoining deck! Guest rooms share Jack N Jill bath! Lower level has wine cellar, studio den, full bath, and huge Room & office!